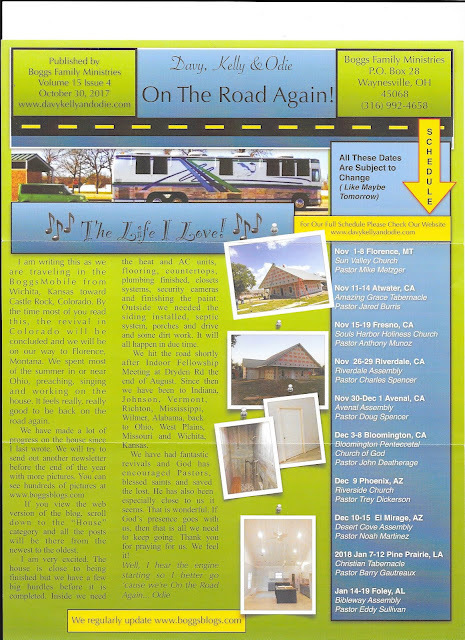 We mailed out Odie's latest On The Road Again Newsletter recently and I am sharing that with you today. I will post a picture of the newsletter first and then I will copy the text and schedule below. I am writing this as we are traveling in the BoggsMobile from Wichita, Kansas toward Castle Rock, Colorado. By the time most of you read this, the revival in Colorado will be concluded and we will be on our way to Florence, Montana. We spent most of the summer in or near Ohio, preaching, singing and working on the house. It feels really, really good to be back on the road again. If you view the web version of the blog, scroll down to the “House” category and all the posts will be there from the newest to the oldest. I am very excited. The house is close to being finished but we have a few big hurdles before it is completed. Inside we need the heat and AC units, flooring, countertops, plumbing finished, closets systems, security cameras and finishing the paint. Outside we needed the siding installed, septic system, porches and drive and some dirt work. It will all happen in due time. 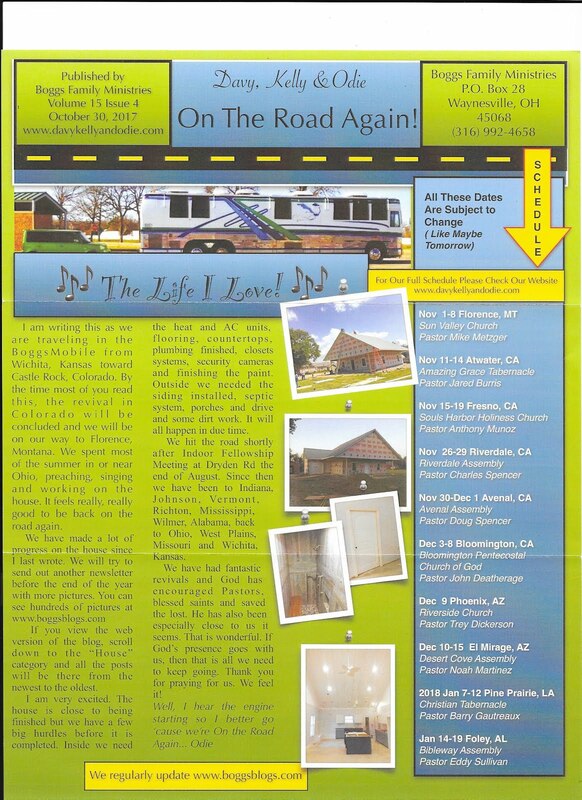 We hit the road shortly after Indoor Fellowship Meeting at Dryden Rd the end of August. Since then we have been to Indiana, Johnson, Vermont, Richton, Mississippi, Wilmer, Alabama, back to Ohio, West Plains, Missouri and Wichita, Kansas. We have had fantastic revivals and God has encouraged Pastors, blessed saints and saved the lost. He has also been especially close to us it seems. That is wonderful. If God’s presence goes with us, then that is all we need to keep going. Thank you for praying for us. We feel it! You can see our full schedule HERE.